I originally had great plans for posts about this jacket. I made a toile and did pattern adjustments. I used non-standard seam allowances and two different sorts of interfacing. There are sleeve heads and a very unusual fastening. But it’s how it came out that counts, so this is going to be about the end result and not the process. It is from Vogue 2607, a Guy Laroche suit pattern that’s long out of print. I was attracted by the collar and the relatively simple style. I wasn’t convinced I’d be able to execute the double welt pockets flawlessly so I switched them to single welts, but otherwise didn’t change any design details. The fabric is a silver metallic twill from Truro Fabrics. It has a slight stretch. At the time of writing it’s still available. I found it in the denim and chambray section but it’s lighter weight than what I think of as denim; it wouldn’t be good for jeans for example. 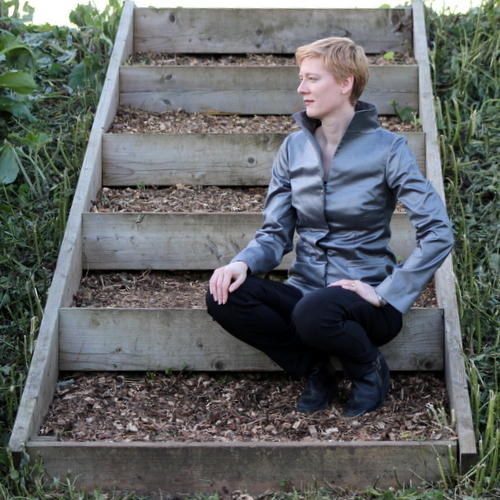 The jacket is interfaced throughout the body as per the pattern instructions but you can see on the sleeves that the fabric has a bit of drape. The jacket is lined in a black poly stretch satin from The Lining Company. The collar on this is enormous. I haven’t really worked out how to wear it. It can get in the way when worn up (see picture below!) but folding it down seems a bit of a shame. 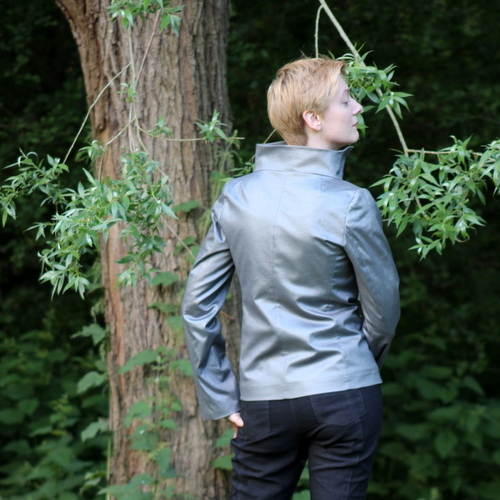 In fact it’s not just the collar: the whole jacket is very difficult to style. It’s come out rather more formal-looking than I intended. The black jeans and boots I’m wearing in these pictures are the best I’ve come up with so far but I wonder if this one isn’t best kept for weddings! The pockets have come out a bit more clearly on the picture below. They are very shallow; about deep enough for a credit card or your keys but nothing more. I wish now that I’d made zipped pockets instead of the welt pockets as they’d make the style more casual. So, honest options? Should it be reserved for weddings and christenings and if so what on earth do I wear with it, jeans probably not being appropriate? Or can this be made to work for every day? 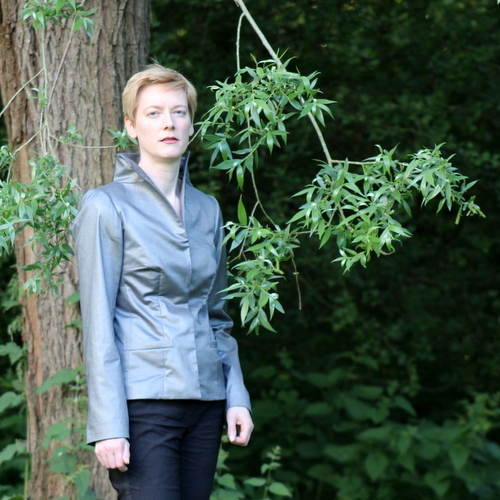 Posted on June 13, 2015 June 9, 2015 by catherinedaze	This entry was posted in dressmaking, Finished, sewing, Silver, vogue and tagged 2607, dressmaking, guy laroche, jacket, sewing, silver, vogue. Bookmark the permalink. It reads like leather in your pictures so it can easily be worn casually. It looks great with the black jeans and boots that you’re wearing. The collar, when turned up, looks just fine even though it may feel in the way for you. It’s a cool jacket. I had missed you CD, so glad you are back. You look amazing in this jacket and I like the bluish grey colour which works so nicely with your eyes in the first picture. I would not have looked twice at the pattern myself – but I am always amazed that you pick out what I think is an unpromising pattern and then make something great with it. I am not sure if there should be a category – weddings only – because just about everything can be worn as work, weekend or evening wear if styled appropriately. I like this with jeans, but I imagine it might work fine with a tweedy or kilted skirt, over a tight short black dress with boots, or open over a charcoal dress for work. I would mix this fabric with texture, but I know you like the more futuristic look. It looks like a leather jacket so everyday is absolutely do able in just how you styled it here. Equally a dark or white pencil skirt could work. I love this! And in silver metallic, too!!! I bought this pattern years ago just for that gorgeous collar. Your pic of it getting in the way is hilarious. And I think you most certainly should wear it wherever! Definitely not something for putting in the closet for special-occasions-only. I love how you’ve styled it in your pics here. So nice to see you back, sewing yet another amazing garment. I was just going to post a comment on your blog to see if you’re ok since my blog roll says it’s been 4 months , and then there was your brand new post from today! yay! In the pix, on my monitor, it looks like you could totally wear it for every day, exactly the way you styled it. It is a futuristic look that is totally you. As for the collar being too tall, do you think it might soften over time? The jacket is really gorgeous! I think that as long as you pair it with something narrow and clean-lined on the bottom, you can wear it any time, day or night. I can see it over a sheath dress just as easily as over the slim jeans you’re wearing here. Very nice jacket! Beautiful jacket! The shape is so interesting- I love that collar! I think the sheen is what makes it seem so formal. I think maybe with a higher neckline/scarf or worn open it would look more casual. I love the color on you! Ditto what everyone else said. You have made a really interesting jacket! Hmm, it’s dramatic but I think it can be worn casually. Perhaps something about the fabric doesn’t come off in the pictures though. I have just been making some double welt pockets and discovered they aren’t just single welts with double the work. They really are quite different because with a double welt, the fabric wraps around the seam allowances above and bellow the slash and this supports the welts. With a single welt, the upper seam allowance is turned to the inside and the lower is only half the height of the welt. Anyway just something I hadn’t thought through before attempting them. Welcome back – and another awesome jacket – I second the ‘style it like a leather jacket suggestions’, it looks fabulous regardless! iM in agreement with everyone else- it doesn’t look ‘ too formal’ from what I see. It obviously makes you feel it is though, is it quite a stiff twill? Might it feel less formal as you wear it and it softens a bit? I love it with jeans personally. And I like the idea of wearing it with a tight black knit dress too. 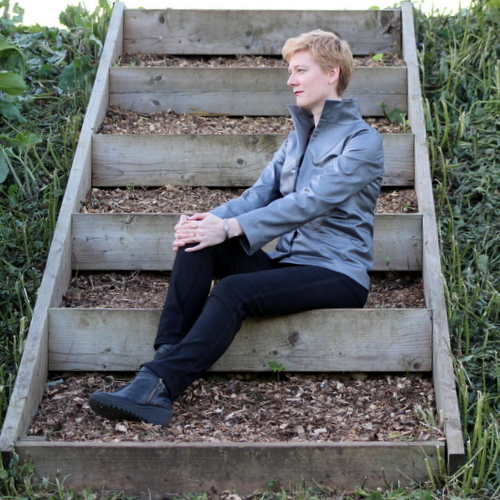 Agreed it looks leathery – I live in jackets in spring and summer so I’d just wear it as a normal jacket. Actually it is do much like your style – I love it, and could not pull it off. I am totally no help with styling. I like the idea of Wedding Only appropriate with jeans. Fabulouss jacket and fabulous collar. It probably need to be worn lots. At work. With ordinary clothes. Whatever you do, it’s striking. Unique. Interesting. Beautifully crafted. Lovely jacket. 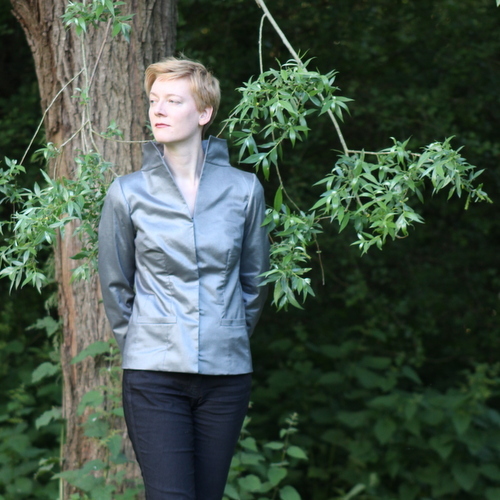 I made this Years ago as an evening jacket with a coordinating fishtail skirt so I cannot give you any styling advice, but it is a great pattern! Looks like you did a great job getting the collar to stand up. I guess just embrace it as a statement jacket and wear it with simple plain pieces.